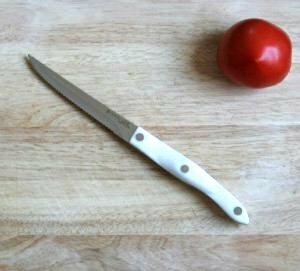 Are you looking for high quality kitchen knives? Then you might be interested in Cutco knives. All their products come with a Forever Guarantee, and most of their knives never need sharpening. If you spend alot of time in the kitchen cooking from scratch, investing in these high quality tools will save you time, and elbow grease. Cutting is effortless with these knives. Follow the link to Amazon.com, where you can buy Cutco knives. You might want to start with the Cutco White Trimmer #1721W , a basic all-purpose knife. When you see how great these knives are, you’ll want to add more of them to your set. Cutco knives are Made In America. Posted on August 12, 2012, in Food, Recommended Products and tagged cooking, cutco knives, kitchen cutlery, knives, vegetable knives. Bookmark the permalink. Leave a comment.